Sandblasting is the “generic” term for abrasive blasting. This terminology resulted because sand was the first abrasive material used in a blasting process over 100 years ago. This is ironic, in that the use of actual silica sand is never recommended due to its health hazards. Sandblasting or abrasive blasting (also referred to as media blasting) is the operation of forcibly propelling a stream of abrasive material against a surface under high pressure to smooth a rough surface, roughen a smooth surface, shape a surface, or remove surface contaminants and paints/coatings. Compressed air is typically used to propel the blasting material (often called the media). There are several variants of the process, such as soda blasting, bead blasting, and shot blasting. To keep things simple, we will mostly refer to the generic terms “sandblasting” and “sandblaster”, although most of what follows applies all of the variants mentioned above. Also, please realize that the information given here is by no means a comprehensive guide to sandblasting. Think of it as an introduction to sandblasting for people who have never done it before, or who have an interest in finding out if sandblasting is right for doing their kind of work. Before we go much farther, it is very important to remember that your air compressor is the most important component of your entire sandblasting system. The production rate, efficiency and cost per square foot of sandblasting are highly influenced by the volume (CFM) and pressure (PSI) of compressed air maintained through the blast nozzle of your sandblaster. We will get into more about this as we go on, but please keep this in mind. There are two general types of sandblasters: portable and cabinet. As the name suggests, a portable blaster can be moved around a work area, or taken to a remote location, if desired. A cabinet is a fixed, enclosed unit, which is placed in a fixed location like a workshop or garage. There are two general kinds of sandblasting cabinets cabinets: siphon cabinets (sometimes referred to as suction cabinets) and direct pressure cabinets. In general, a siphon cabinet is less expensive to purchase than a direct pressure system and has lower maintenance costs. Production rates are not as high as with a direct pressure cabinet. If you are a typical hobbyist or a business, requiring occasional use, a siphon system will usually work out just fine for you. If you are a high volume production business or an individual requiring faster production rates you may want to consider a direct pressure system. Whether you use a siphon or a direct pressure cabinet, you will need a dust collector, which attaches to the cabinet and removes airborne dust and debris from the cabinet, giving you clear visibility inside the cabinet. You can’t get much work done if you can’t see what you are doing! There are also recycler style dust collectors available, which filter out debris and dust and recycle good media back into the cabinet. The first step in learning how to sandblast is to determine what type of work you want to do. Based on the answer to that question, you can determine what kind of equipment you need. For example, if you want to strip paint from a surface, which is too large to fit inside a sandblasting cabinet, you will need to use a portable sandblaster. If you want to sandblast parts and pieces inside your garage or workshop, you may want to use a sandblasting cabinet. If you are unsure of exactly what equipment would work best for your individual needs and budget, it’s best to get advice from an expert. One of the best is ACE Automotive Cleaning Equipment out of Michigan. 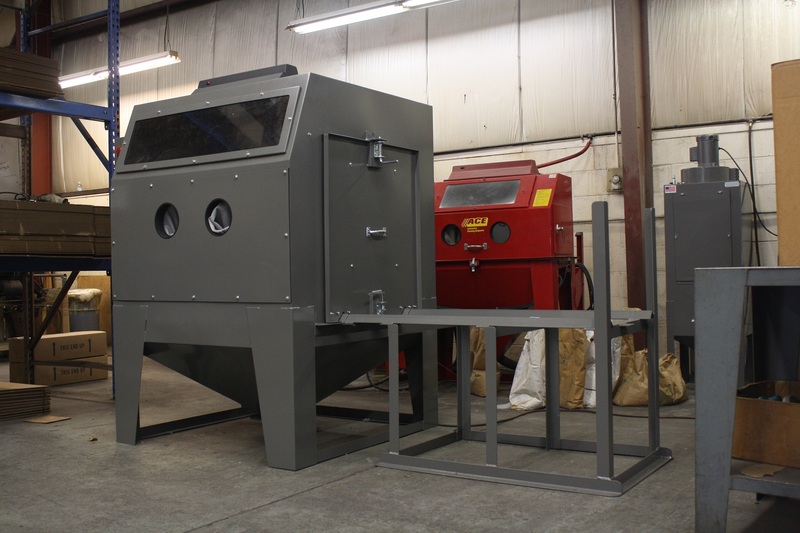 They make high quality, affordable sandblasting equipment of all kinds, and have years of experience in helping people with their sandblasting and soda blasting needs. 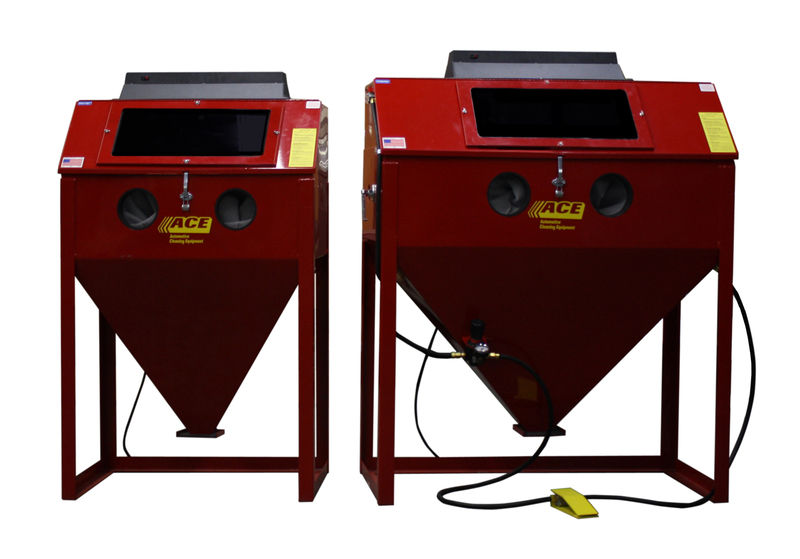 Once you have determined the general type of sandblasting equipment that is best for your needs, it is very important to determine the best type of blasting material (media blasting) for the specific kind of work you want to do. You also need to determine the best grit size to use for your job. Do you want to clean up heavily rusted metal, or do you want to strip the finish from a wooden chair? Do you want to remove bottom paint from a fiberglass boat without harming the gelcoat, or do you want to etch a design in a piece of granite or glass? There are many different types of blasting materials, each with its own pros and cons depending on the type of work you want to do. Although sandblasting is one of the generic terms for abrasive blasting or media blasting, you should never actually use any type of silica sand to sandblast! Silica sand can cause a type of lung disease called silicosis. Some of the most popular blasting materials are aluminum oxide, glass bead, silicon carbide, and baking soda (sodium bicarbonate). Aluminum oxide would be a good choice for cleaning that heavily rusted metal, but you might very well blow a hole in that fiberglass boat bottom with it. Soda blasting would be best for stripping the paint off of the fiberglass boat bottom, but would not remove that heavily pitted rust (although a mixture of 80% soda and 20% aluminum oxide would). Blasting material normally comes in different grit sizes. The higher the grit size is numerically, the finer the particle size. The lower the grit size, the coarser the particle size. Lower grit sizes are more aggressive, in general, than higher grit sizes of the same blasting material. For example, Aluminum Oxide 60 grit is more aggressive than Aluminum Oxide 120 grit. It’s important to use the correct material in the correct grit size to properly do your work. Again, if you aren’t sure about what blasting material to use for your type of work, get a recommendation from an expert. It will save you a lot of time, frustration, and money versus trying to guess, if you are not sure. Getting back to air compressors, all sandblasting equipment must have the required air pressure, usually referred to as PSI (pounds per square inch) and the proper volume, usually referred to as CFM (cubic feet per minute) to operate properly. All air compressors are rated by these factors. In the specifications for an air compressor you will see these ratings expressed as “x” cfm at “y” psi. Make sure that your air compressor can generate at least the minimum required volume of air (cfm) that your sandblaster requires, and more than the minimum cfm is generally better. For example, if your sandblaster requires 12 cfm to operate with the nozzle size you are using, make sure that your air compressor can generate at least 12 cfm. It’s alright if it generates more than 12 cfm, but you will experience pressure drops if it can’t deliver the minimum. Keep in mind that the velocity of the abrasive material, as it leaves the blast nozzle, and the efficiency of the sandblasting process are going to be reduced by a little over 1% for every pound of pressure drop below the ideal blasting pressure. So if you are trying to blast at 100 psi, but you can only maintain 80 psi (because your compressor does not deliver enough cfm), that pressure drop will reduce the velocity and efficiency of your sandblasting process by around 20%. Also remember that the cfm output of your air compressor will determine the size of the nozzle you can use with your sandblaster. In other words, if you have enough cfm to maintain blasting pressure with a certain nozzle size, you may or may not have enough cfm to blast with the next bigger nozzle size, without experiencing a pressure drop. If you are unsure about what psi to use, just start out at a low blasting pressure on the adjustable pressure regulator and work your way up until you get the result you desire. But keep in mind that blasting at high pressure uses more material per minute and breaks the material down faster, if you are using a reusable type. So for example, if you are blasting with glass beads and getting good results at 45 psi, going up to a higher pressure will cause the glass beads to deteriorate quicker. You may get slightly more productivity, if any, but you will use up your media quicker. There is a tradeoff. Moisture in compressed air used for sandblasting, media blasting, and soda blasting creates never ending problems. If not removed by some means, moisture will cause the blast media to become damp or wet and it will not flow out of the blaster evenly, if at all. The result is unwanted downtime. The relative humidity in the atmosphere is the source of moisture in compressed air. That means that if you live in a high humidity area, or are blasting on a high humidity day, you may very well experience a moisture related issue. The higher the humidity, the more moisture issues you are likely to encounter. There is no way to remove moisture once it enters your blaster. You must remove it before it enters the blaster. There are a number of different types of devices available to remove the moisture and reduce the chance of clogging. A lot depends on the size and type of air compressor you have. Whatever type of moisture control device you choose, it must be able to handle the cfm output of your compressor. For example, a moisture control device rated for 10 cfm will not be adequate for use on a 20 cfm air compressor. You will need an air supply line to connect your air compressor to your sandblaster. In general, small Inside Diameter (I.D.) hoses, used for tools like air wrenches, should not be used for this purpose. Also, you should not use push in male/female type connectors in your setup. An external claw type connector, commonly called a “Chicago Style”, does not restrict the air flow through a connection point. The I.D. of the air supply line, the type of quick connector used, and the length of the air supply line all factor into potential pressure drops from the air compressor to the sandblaster. In general, if you are going to run anything over 30 feet of air supply line, you should use at least ¾” I.D. hose. If you are uncertain about the size and length of the supply line, or type of connector to use, check with your sandblasting equipment manufacturer to determine the best air supply line setup for your particular machine. When using any type of sandblasting equipment, operator safety is the utmost concern. When blasting in an enclosed cabinet, the operator is isolated from the actual blasting environment, which is contained inside of the cabinet. 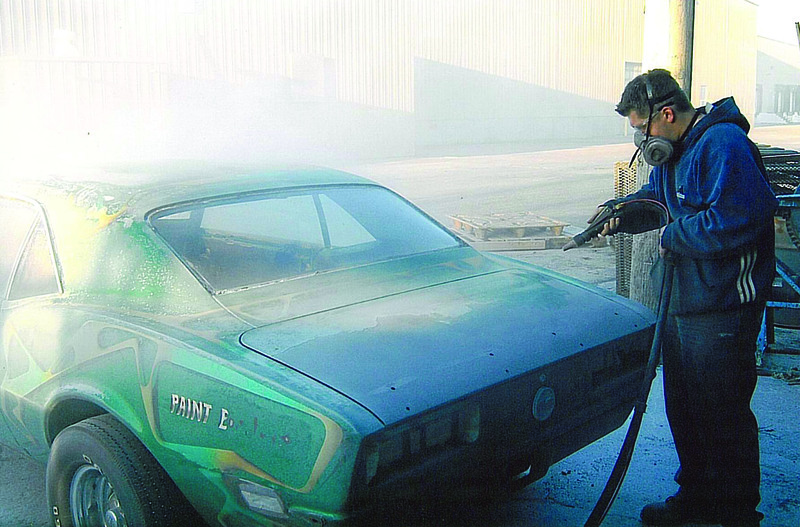 Even this type of sandblasting requires attention to safety. Most good sandblasting cabinets utilize a safety switch, which cuts off the supply of compressed air to the blast gun nozzle, when the loading door or top is open. This prevents the operator from accidentally activating the blast stream when loading or unloading the cabinet. Heavy duty gauntlet style gloves of rubber or neoprene are designed to withstand the harsh environment within a blast cabinet, protecting the operator’s hands and forearms. When using a portable sandblaster, the operator is exposed to the blasting environment. Under these conditions, protective gear is used to keep the operator safe. Any type of sandblasting generates some sort of dust and debris. It is essential to protect yourself from breathing in this dust, regardless of the type of media used. Some sort of respirator is necessary. There are many kinds available from simple respirators to fresh air systems. Make sure you use one! Once again, do not use silica sand under any circumstances! Exposure to the silica sand dust can cause a lung condition called silicosis, which is very serious. Don’t take any chances with your health! 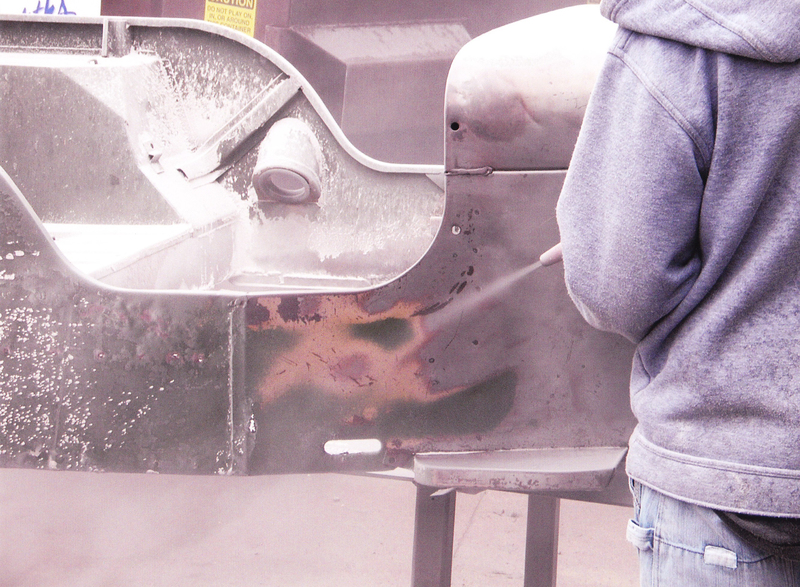 When sandblasting, you can be certain that some of the media and debris will bounce back towards the operator. Therefore, you must protect your eyes! Always wear some sort of eye protection like a blast hood, face shield, or fully enclosed google, at the very least. Serious eye injury can occur, if you don’t protect your eyes. Exposing your skin to either the direct blast stream, or the media and debris bounce back, can result in serious injury. Always make sure that you don’t expose your skin to potential injury. Wear long sleeved clothing, long pants, work gloves, and shoes or boots. In certain applications, you may even be advised to wear a full blast suit. Don’t be the person who tries to sandblast in shorts, tank top and sandals. That’s just asking for trouble. Most portable sandblasters have a “deadman” remote control system. That means that the blast stream can only shoot out of the nozzle when the operator engages some sort of handle or trigger to start the blast stream. “Deadman” systems will automatically shut off the blast stream if the handle is dropped, or the operator take his hand off of the handle or trigger mechanism. “Deadman” systems can be as simple as a spring loaded device that physically blocks the end of the nozzle, to a remote system, which actually shuts off the blast stream at the tank. This helps protect the operator, and the surrounding area, from the hazards of a dropped or unattended blast hose wildly spraying abrasive blasting media. Common sense is very important when sandblasting. With abrasive blasting media being propelled out of the blast nozzle at high speed and pressure, you effectively have a potential weapon in your hand. Do not ever point your blast nozzle at any living thing! Do not point your blast nozzle at anything that you could potentially damage. Your sandblaster is not a toy. Treat it with respect, and respect the environment around you. After you have your sandblaster, air compressor, and the necessary lines and connectors, it’s time to start your work project! If you keep the simple basics in mind, you are well on your way to successfully completing your projects. The actual act of blasting is fairly simple. After hooking up your system, do a safety check to make sure everything is in good working condition. Always replace any items that are worn out or damaged. Now that you have made sure everything is properly connected and in good working condition, load your media, turn on your air compressor and set the pressure on the compressor itself to around 120 psi. Set the adjustable pressure regulator on the sandblaster to the desired psi. As mentioned previously, if in doubt, start at a low blasting pressure and work your way up until you are accomplishing the desired results. If you are using a portable sandblaster, you should always keep your blast hose as straight as possible. Never operate you sandblaster with sharp curves in the blast hose or with it coiled up. This increases friction in the blast stream and can lead to premature blast hose failure. If you are using a sandblasting cabinet, always make sure that the debris in the dust collector is emptied out on a regular basis. The filters should also be inspected and cleaned on a regular basis. Allowing debris to build up in the dust collector can lead to poor visibility in the sandblasting cabinet and premature failure of the filter(s) and dust collector motor(s). When using a siphon style sandblasting cabinet, you should load it with 20-25 pounds of media. The pickup site in the siphon tube is located at the bottom of the cabinet. If you overload the cabinet, the weight and mass of the media will compact in the bottom of the cabinet and will not allow the media to flow freely. As the media is reused constantly, it will degrade and the efficiency of the media, and the sandblasting process, will decrease. It is easier and more efficient to change out the media when using lesser amounts. If your abrasive blasting media gets wet or moist, it is less wasteful to discard this lesser amount. Also, debris, cleaned from the object you are blasting, will fall through the work grate. This will mix with your media and large pieces can clog the pickup tube or blast gun. The use of a fine carbon screen, over the working deck, can catch large pieces of debris and keep your media cleaner. A fine carbon screen or small parts basket can also keep small pieces, such as screws or fasteners, from falling into the media, getting lost or clogging the pickup tube. There are two types of direct pressure sandblasting cabinets: side mounted pressure vessel or bottom mounted pressure vessel. The side mounted version has a tank that is loaded with media. These tanks typically hold around 80-100 pounds of blasting media. Since there is no recycling of the material, the tank must be reloaded as the media is used up. Spent media will fall into the bottom of the cabinet, where it can be unloaded through some sort of spring loaded trap door. The media can be poured through a screen and reused until it breaks down too much. Direct pressure cabinets with a bottom mounted pressure vessel will reuse the same media continuously. The top of the pressure vessel (tank) is open allowing media to fill the tank. When the operator engages the foot pedal, the top of the tank closes and the tank is pressurized. When the operator releases the foot pedal, the tank de-pressurizes and the media enters the tank. The media degrades with use, so it will be necessary to change out the old media with new media when there is a noticeable degradation of blasting efficiency. Whether using a portable sandblaster or a cabinet sandblaster, the operator will have to experiment to find the proper distance from the nozzle to the surface being blasted. There is no hard and fast rule for the proper distance. Every job will be different. You will quickly see if you are too far away or too close for the best blasting efficiency. Blasting technique will also vary with individual jobs, but in general, you should not blast perpendicularly straight into the surface being cleaned. The angle of approach can be anywhere from 45 to 105 degrees to the surface. This allows the abrasive media the work more efficiently. You should also move the blast stream forward across the surface being cleaned. Do not pull the blast stream backwards over an area that has already been blasted. All jobs will be different, but in general, smooth easy strokes, with a degree of overlap, work well. Some people prefer a slight side-to-side arcing motion, like you would use washing off your driveway with a garden hose. Don’t be afraid to try different techniques, you will quickly see what works and what doesn’t for your job. As I mentioned earlier, what you have just read is an introduction to sandblasting, a “How to Sandblast” for beginners. No matter what you do, ALWAYS take all necessary safety precautions to keep you, your environment, and other living things around you, safe from harm. Sandblasting is a great way to accomplish a large number of different stripping and cleaning projects. You can do it, so get it done!